« You’ve Gotta be Kidding Me! I am a girl who very much likes football. Really. 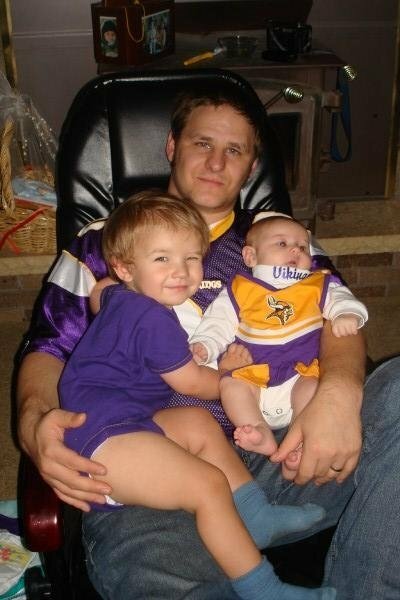 My whole little family could be a walking Viking commercial. (In looking for pictures to post, I found I had more pictures of us in Viking gear than I thought and had a hard time choosing!) I like football, in general,so much I will (willingly) watch games that are not featuring “my team.” Now before the rest of my contemporaries throw me under the bus for “betraying my kind,” know that it is a great bonding time with my hubbyman, one that the kids have gotten in on. 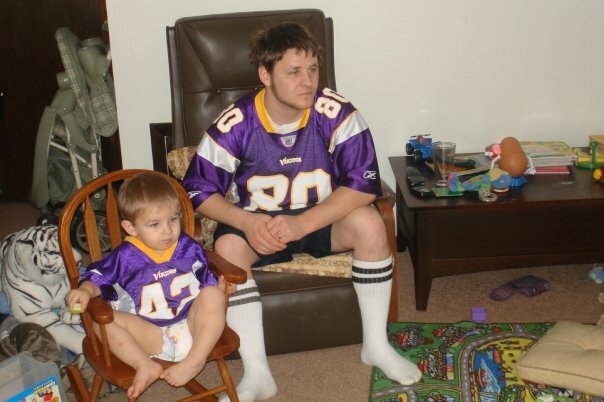 Seriously, Big E would sit and watch a whole game with his daddy when he was too little to be watching tv! And they love “our” team so much that they have a hard time accepting that a) there are any other teams, b) anyone would cheer for any other team, and c) that their beloved Vikings could not win a game. (All Viking fans have this problem, I’m sure. Please, withhold your laughter. It’s bad enough to be a fan. Don’t kick us while we’re down.) I came across this video via the f’book this morning and laughed watching it…and I assure you, you will too. And if you’re not laughing, you are probably commiserating. Watching a game with daddy. Really. Big E: The Vikings show? Is it time for the Viking show now? Me: No, that was a couple days ago. Big E: Did you forget to tell me what time it was? Me: No, you watched a little bit of it, but you were watching a movie in the playroom instead. Big E: I don’t think you told me the Viking show was on. Daddy would have wanted me to watch the Viking show with him. He likes me to see them win and do the touchdown. Me: I know he does. But the Vikings didn’t win this time. Big E: (getting very upset) Yes, they did. Me: I wish they had, trust me, but they didn’t win this time. Big E: I am never going to trust you because I did want them to win and I didn’t want to watch a movie instead of the Viking show. Miss E: Why is that little girl crying? Me: Because she wanted the Vikings to win. Miss E: Did they not do many touchdowns? Me: No, they did not do many touchdowns. 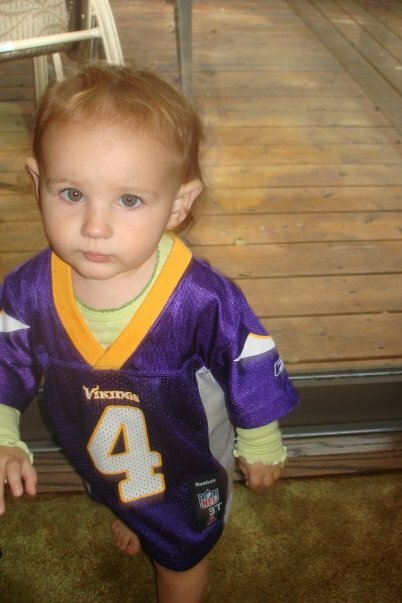 Miss E: (begins to cry) but I only like it when the Vikings win. Me: I know, me too. Miss E: (Throws herself on the couch, while crying) You should never say the Vikings didn’t win. They only win. Me: She’s bigger than you. You are the baby. Littlest E: (pointing at computer screen) Baby! (pointing at himself) Big boy! 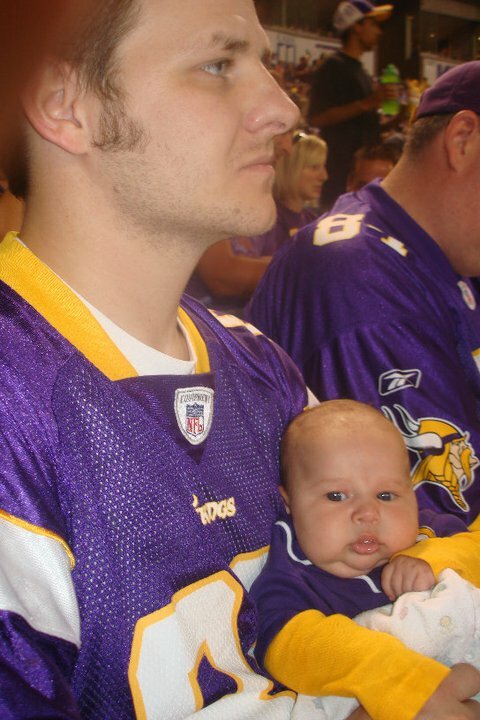 Littlest at a Viking's game! 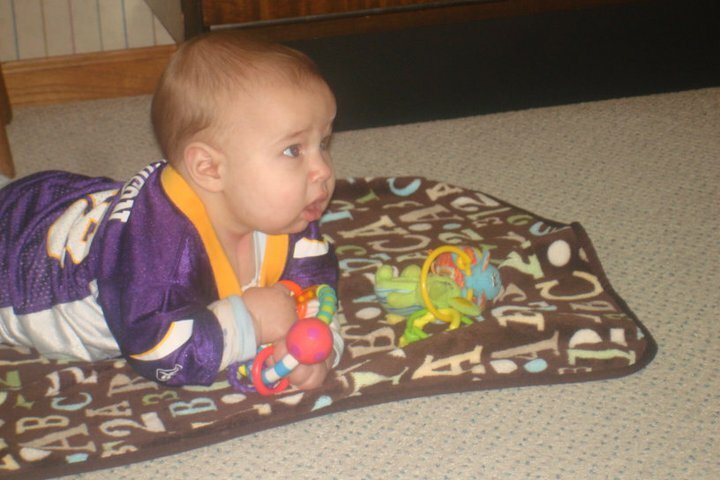 Even my littlest man thinks it's shocking how bad the Vikes are this year! Fans for life! I LOVE IT!!! Will you please teach me to love football? My husband would be eternally grateful! haha! I grew up where my dad was home more than my mom, so between him and my 3 brothers- sports were ALWAYS on! When I got married and my husband only watched one team- I thought I’d hit the lottery! I think it’s easier to “get into” if you have a team that you like (or have decided to like)!